If you find yourself planning a business trip to Charlotte seriously consider making the Ballantyne Hotel and Lodge your home base. It is centrally located within 20 minutes of the Charlotte-Douglas International Airport and downtown. In addition to the championship golf course and the nationally acclaimed Dana Rider Golf School, this AAA Four Diamond hotel offers on site amenities such as indoor and outdoor pools, a full service spa, tennis, fitness center and several fine and casual dining options. Or, if you are a road warrior, as we were, passing though town on the I77 heading to points southern it is well worth your time to make a pit stop here for a really enjoyable round of golf and some R&R before jumping back in the road. Located in the heart of the Ballantyne community just south east of downtown the facility is surrounded by ample shopping and dining options and the Ballantyne Corporate Park. There are also numerous Charlotte must sees nearby. For the NACAR fan with a need for speed a visit to the Richard Petty Driving School, Victory Lane Karting or the Charlotte Motor Speedway will satisfy your inner speed demon. Outdoor enthusiast can experience white water rafting, kayaking, rock climbing and more at the US National Whitewater Center and the Carowinds Theme Park offer rides and water park experiences for all ages. If live entertainment or the theatre scene is more to your liking then programs offered by the Children’s Theatre of Charlotte, Ovens Auditorium, Blumenthal Performing Arts Center or Bojangles’ Coliseum are right up your alley. Are the kids bouncing off the walls and looking to blow off some steam? Then head over to the Sky High Indoor Trampoline Place just minutes away and the kids can bounce to their hearts content. The Accommodations: The choices of accommodations at The Ballantyne are many with guest rooms and suites available in the hotel proper or a short walk away at the Lodge or Cottage. The guest rooms in the hotel feature marble entrances and 10 foot ceilings with the Grand Deluxe rooms overlooking the golf course. The room decor is accentuated with custom made armoires and desks, the marble baths are elegantly appointed and only the finest Egyptian cotton graces the beds. There are three suite choices to be enjoyed with the Presidential topping the list. With four available these 1200 sq ft suites, with private balconies overlooking the golf course, offer a dining table that seats 12, kitchen, a living room replete with faux fireplace, original art work and custom furnishings. The master sleeping area enjoys a walk in closet, marble bath, separate walk-in shower, dual vanity and many other upgrades. 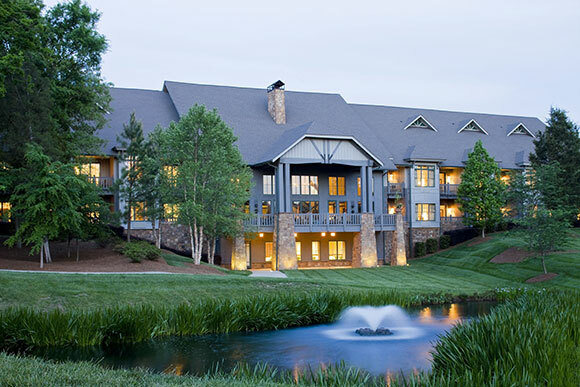 The Lodge at Ballantyne is a 40,000 sq ft facility located adjacent to the first tee a short walk from the hotel. With a rustic mountain ambiance the Lodge is home to 35 guest rooms of varying configurations, two large meeting rooms, four boards rooms, a business center, library, fitness room and social space in a second floor loft with pool tables and a flat screen tv. While the Cottage at Ballantyne enjoys all the amenities of a fine home. With fairways views, the four king bedrooms each offer a private bath and flat screen tv, make the cottage an ideal venue for a group to hold out. Cottagers have full access to the hotels amenities and grounds. The Food: Fine dining at the Ballantyne can be relished at the Gallery Restaurant. Serving contemporary American fare the Gallery is open for breakfast, lunch and dinner. For those looking to luxuriate with an après diner fine wine or Scotch the Gallery Bar boasts one of the most noted Scotch collections in the state stocking. The main lobby Veranda Bar will satisfy your sweet tooth offering coffee, muffins and pastries. For the health conscious Spa patrons a specialty menu is served in the spa lounge or if a casual meal is your craving sandwiches and wraps are served at Golf Pavilion. 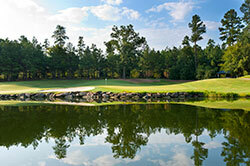 The Golf: The Golf Club at Ballantyne is truly a wonderfully playable course for players of all abilities. Offering four sets of tees, the skilled low handicap player will find the routing a challenge while beginner and intermediate golfers will enjoy the game with an opportunity to reach greens in regulation if playing the appropriate tees. 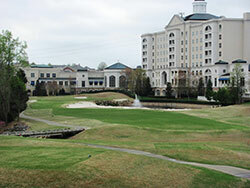 Although the course is located in the middle of the Ballantyne Business park well placed stands of trees, mounding, ponds and great use of the creeks that meander throughout the property creates a park like setting on most holes offering an oasis from the bustle that surrounds. 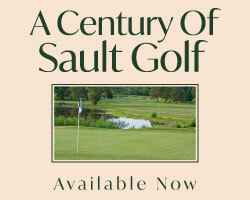 The course is routed through a wonderful blend of parkland and waterholes. There are no long hauls between holes and no mountains to climb so for those who prefer to walk it is not overly strenuous –although there are times when carts are mandatory. Over the years a continuous improvement plan has been in place and one of the more significant upgrades was the conversion of the green surfaces to Champion Ultra Turf a few years back. A keen ability to read greens will be rewarded for the greens consistently run smooth and fast and are always in good condition. Playing to yardages ranging from 4760 to 6740, this is a friendly golf course for golfers of any ability, forced carries are few allowing for players to attack the flags or roll up approaches. There is not a weak hole on the course with the back nine closing stretch beginning at the 14th tee offering some great shotmaking opportunities. The signature home hole is a beautiful dogleg left par 4 with all the elements required of a great finishing hole. A precision tee ball is needed to negotiate the crossing creek off the tee and the forest left. Long hitters beware for the dreaded straight ball will find the massive bunker that guards the right side from the corner of the dogleg all the way to the green some 125 yard away. The approach is no picnic either for the multi-tiered green complex is protected by strategically placed bunkers left, right and long and a large right side pond awaits the brave soul who attacks the back right pin position and comes up a tad short. A three marked on the scorecard here will earn you well deserved après round bragging rights, and most definitely win the press, over a scotch in the Galley Bar. The Golf School: The Dana Radar Golf School is an award winning full service golf academy utilizing the latest stat-of-the- art technologies, offering club fitting services and is home to a Tileist Performance Institute program. 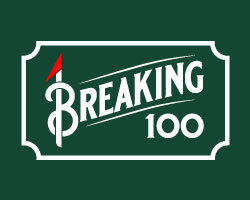 Hotel guests can improve their game through private lessons, three day golf schools, women’s only programs, beginner program, junior clinics & camps and unique team building programming offer through the School.